From Culloden to the American Revolution, Hugh Mercer lived an adventurous life. He was an unusual combination of doctor and warrior. Dr. Mercer was a surgeon in the army of Prince Charles Edward Stuart that was defeated at the battle of Culloden in 1745. He was mortally wounded while leading an assault force on British-held Princeton in 1777. ■ Mercer was born about 1720 in Aberdeen where he studied medicine at the University of Aberdeen. After Culloden, he fled to the American Colonies and the Scottish settlements in Pennsylvania. ■ He practiced medicine before joining the Colonial forces fighting the French and Indian wars. 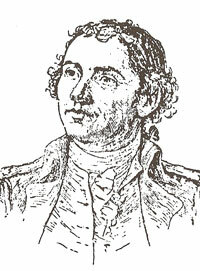 He was promoted to lieutenant-colonel and put in charge of the fort at Pittsburgh. Mercer was wounded at Monongahela and then later returned to the practice of medicine in Fredericksburg, Virginia. ■ When the Revolutionary War seemed imminent, Dr. Mercer organized the Virginia militia and was appointed colonel. With the outbreak of war, General Washington promoted him to brigadier general. ■ His untried militia wavered in the face of an attack by British regulars near Princeton. Setting an example, he stormed into the British lines, but was cut down and bayoneted repeatedly. Washington asked General Cornwallis for a truce to remove General Mercer from the battlefield. He died a few days later. ■ General Mercer�s funeral was attended by 30,000 people, and the Philadelphia St. Andrew Society erected a monument to his memory in the Laurel Hill cemetery. ■ Six states have counties named for Dr. Mercer. They are Illinois, Ohio, Pennsylvania, West Virginia, New Jersey, and Kentucky.